What goes into making a truly entertaining outdoor space? Lush greens and brightly colored flowers… a pool? Or is it the amount of seating options that you have? Summing up, what makes an extraordinary entertainment space can’t be narrowed down to one or two things. So, here is a list of the top 10 ideas for making your outdoor area a place where you can entertain, relax and have fun! 1) Plants – Trees, shrubs, flowers, and grass all bring life and color to your entertaining space. 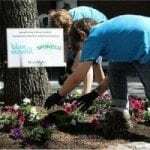 Unlike most of the other items on this list, the plants in your yard can be changed according to season which will create intrigue and nuances in your surroundings. Pick select areas in your outdoor area that you want to highlight and plant bold colored flowers or shrubs to rein in people’s attention. 2) Pool – Don’t let the naysayers make you doubt it…having a pool in your yard IS like having a little piece of your own heaven. Cool off, have fun, get exercise, it really doesn’t matter- pools are amazingly fun for kids young and old. 3) Fireplace – Constructing a fireplace or fire pit will allow you to entertain long into the night and throughout more of the seasons. A fire element can be used to brighten up the night, cook food, stay warm or keep the bugs away. 4) Outdoor Kitchen – By creating an outdoor kitchen you will be able to keep the entertainment going while you cook. Include a refrigerator in your setup and eliminate trips into the house on hot summer days to get drinks and other items. 5) Pizza Oven – Why go out for brick oven pizza when you can make it yourself! And pizza isn’t the only thing you can cook; use your brick oven as a grill and roast vegetables, cook meat or make a doughy dessert. 6) Outdoor Bar – Build a bar area into your outdoor kitchen or any space in your landscape and experience the feeling of living at a luxury resort. Make the bar a part of your pool and see how much fun you can have just staying in the water the entire day. 7) Dining Area and Seating – Why go inside to eat when the weather is this nice? Keep the house from becoming a mess and stay outside to eat your brick oven pizza! Create several areas in your space with seating and/or tables so that guests can feel comfortable and break off into groups for smaller conversations. Or, have the kids sit by the pool while you enjoy your soft, cushy chairs near the fireplace. 8) Pergola – Create shade from the sun and cover from the elements by building a pergola or pavilion. On hot summer days getting out of the sun, in between dips in the pool, can be a necessity. Give yourself a place to enjoy the beautiful weather out of the harsh rays. 9) Water Feature – If you want to relax, you need a water feature. Few things can drown out background noise like the trickling sound of a fountain. Establish an ornate or naturalistic focal point with a flowing waterfall or pond with aquatic life. 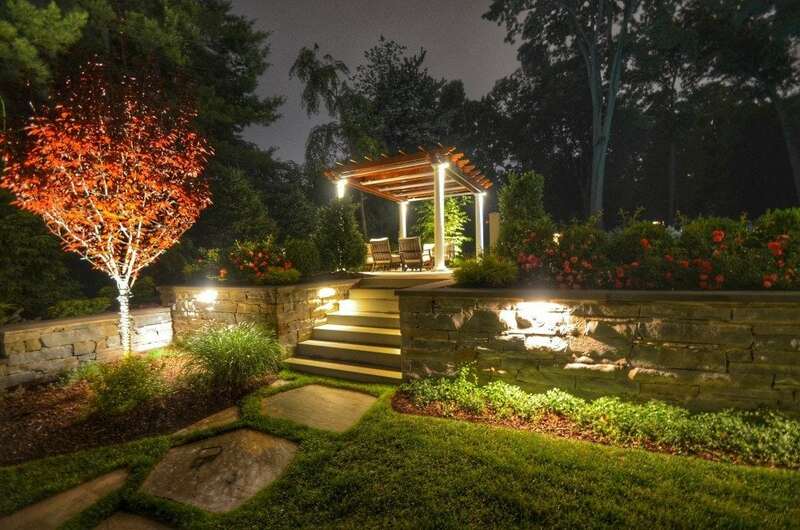 10) Landscape Lighting – Illuminate your outdoor space to make it useable and safe well into the evening hours. Spotlight an area where there is a water feature or create ambiance in a seating area to engage your guests. Landscape lighting has the ability to make all of the best attributes of your landscape shine and stand apart. Did Sponzilli Landscape Group complete your home’s custom landscape design? Give a review of our services on Houzz and get in the running to receive an American Express gift card today! During the fall of 2014, The Whitney Museum commissioned Sponzilli to complete the architectural landscape design for their new location at the base of the High Line entrance on Gansevoort Street in NYC. The Whitney Museum, well-known for pioneering the procurement of American art, needed the project to be complete by May of 2015 for the grand opening of their new location. Sponzilli supplied and installed engineered soil, perennial plantings, trees and an irrigation system on the landscape of the property. Piet Oudolf, a Dutch internationally acclaimed Garden Designer, created the perennial planting design at The Whitney Museum to coordinate and flow with his design on the High Line. Sponzilli used nurseries from all around the country to acquire the perennials needed to implement Oudolf’s design. 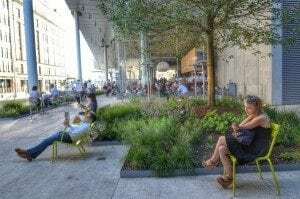 A 3,000 square foot green roof with Sedum Carpet along with a 35 foot tall Red Maple Tree were placed on the Whitney Museum’s property to add to the vibrant and lushly decorated area in NYC’s West Side. 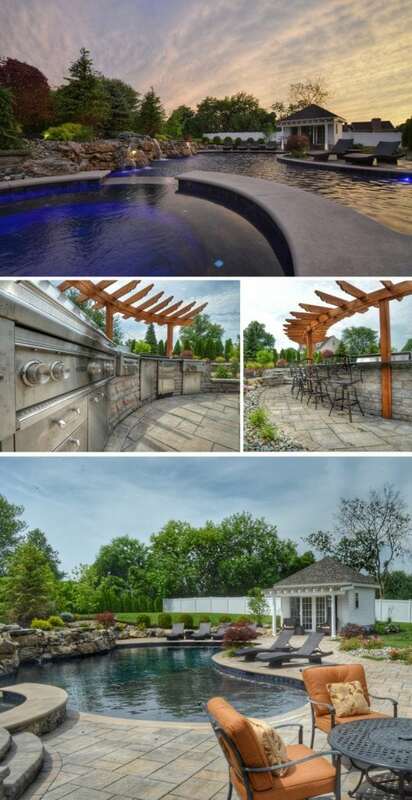 Project Description: This rear yard landscape design was a complete renovation of the entire space. The custom design includes a circular fire pit and seating area adjacent to the free-form gunite pool with cascading waterfall, Unique LED landscape lighting, cabana, curved outdoor kitchen with bar counter and cedar pergola, Lynx Grill, cocktail station and side burner, multi-level Belgard Lafitt patio slab with rustic finish and heavy plantings to screen the neighbors view into the yard. 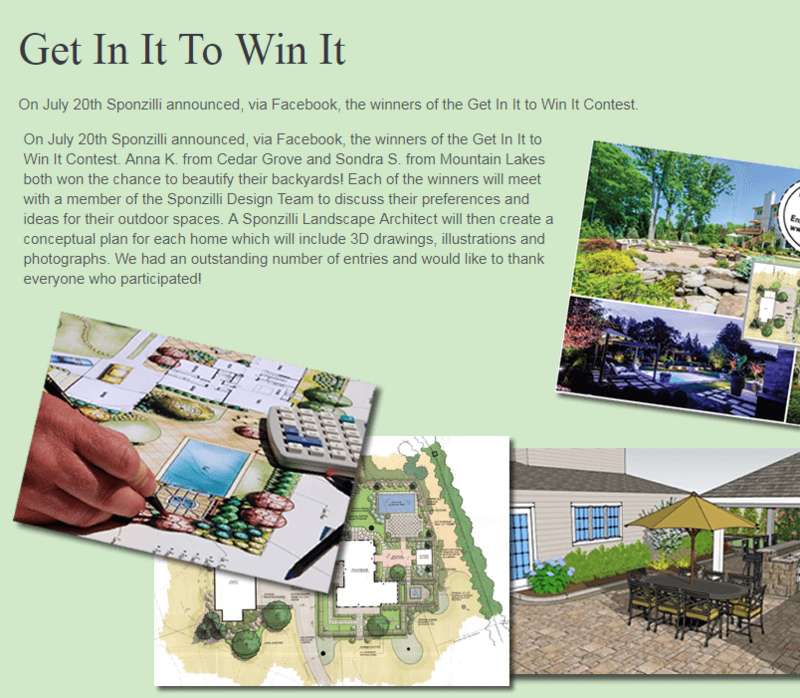 Customer Testimonial: I wanted to take this opportunity to express our deepest Thank You to the entire Sponzilli team. Several years ago, we started the process of building a new home in New Jersey. Once construction began Aaron, Jason and the rest of the team started the process of transforming our yard into a truly special place to enjoy. From project design, interaction with our contractor, construction to finished product, every aspect was seamless on time and on budget. Not only was the work impeccable, but the people were exceptional, polite and always were attentive to the details. Importantly, although the project is complete, the Sponzilli team has remained in touch to make sure all aspects of the project are to expectations. We cannot thank the Sponzilli team enough for all their hard work, professionalism and talent! Sponzilli worked with twenty 4th graders to beautify the urban landscape of Titanic Memorial Park in New York City. The Blue School’s fourth graders gained insight into the importance of city landscaping and its impact on the environment, common garden tools and their proper use as well as interesting facts about flowers. “Teaching children about the benefits of creating green space in an urban environment benefits everyone. We were impressed at how excited the kids were about making a difference in their community and felt the entire event was a positive experience for Sponzilli, The Blue School and The Howard Hughes Corporation” Jason Sponzilli, COO Sponzilli Landscape Group. You may have decided you want an outdoor kitchen, dining area and fireplace in your backyard, but now what? In today’s market, there are an extraordinary amount of materials that can be used to design and create outdoor living spaces. Pavers, stucco, bricks, wood, cultured stone and natural stone finishes will give your landscape a modern, contemporary or rustic look. Selecting plant species, colors, and their desired effect in the design, such as privacy from neighbors, will develop and establish your style throughout your landscape. Whether you want to start your design from scratch, add on to what you already have or showcase your home with landscape lighting, a Sponzilli Landscape Architect will help you choose the materials that work best with your home’s décor and landscaping needs.